We’d love your help. Let us know what’s wrong with this preview of Speculative Story Bites by Sarena Ulibarri. Fifteen bite-sized stories, offering a sampler platter of fantasy, science fiction, and paranormal horror. Within these pages, you’ll find flower fairies, alien brothels, were-bears, and sentient houses. Step inside a museum where all the displays are haunted, follow a siren into the underworld as she searches for Persephone, and discover the doors that lie, literally, beh Fifteen bite-sized stories, offering a sampler platter of fantasy, science fiction, and paranormal horror. Within these pages, you’ll find flower fairies, alien brothels, were-bears, and sentient houses. Step inside a museum where all the displays are haunted, follow a siren into the underworld as she searches for Persephone, and discover the doors that lie, literally, behind the heart. To ask other readers questions about Speculative Story Bites, please sign up. This book is a Library Thing Early Reviewer program edition I received in return for a review. It is a collection of short stories. What follows is my impression of each of the stories. The title for the collection is apt. The collection offers readers a chance to speculate. Many readers, many different interpretations. There is an interesting short biography at the end of each story that offers the reader more writings by their favorite authors. The Business of Thorns by Shannon Phillips Imagine This book is a Library Thing Early Reviewer program edition I received in return for a review. It is a collection of short stories. What follows is my impression of each of the stories. The title for the collection is apt. The collection offers readers a chance to speculate. Many readers, many different interpretations. There is an interesting short biography at the end of each story that offers the reader more writings by their favorite authors. The Business of Thorns by Shannon Phillips	Imagine a flower detective. By that I mean a flower who/which is a private detective. Among other things, it leads to some horrible (or great) puns. “That was my first case. I branched out some from there, no pun intended.” (loc 226). Not intended? No way. Hummer	by Adam Gaylord	When you can’t be with your real wife (because she died) how far will you go to find a substitute? Here is one possible answer. The Gift of Death by Rebecca Roland	This is a new tale of Death, who/which always takes, but never gives. Maybe this time will be different. All the Pieces of my Heart	by Dianne M. Williams	It’s good to surprise you wife on her birthday, but some surprises are too much to accept. And when they are too much, the reaction to a surprise gift might be unnerving. The Wild Corner	by M.T. Reiten	There is probably a moral here about the need or desirability of fences between neighbor. Surely there can be a resolution to a dispute better than this. First Cat	by Larry Hodges	The presidential cat is here to give advice. One of the best pieces of advice is not to try to be too smart; there are consequences. And then there is the note the cat left behind. The Legacy of the Butterfly King	by Anya J. Davis	A story of collections, of those who are the collectors and those who are the collected. Three Grams by Jamie Lackey	Alicia wanted a companion who would be just like her. Daddy always said he would be there for her. Who could be more perfect? But first, there were some adjustments to make. The Museum of Haunted Objects	by Megan Neumann	Ellery wanted to find one more truly haunted object. His successor as museum curator, Lyle, would help him find it. Ellery could only express his gratitude in writing. John Knocking by Kristina Wojtaszek	John had discovered doors to the souls, of animals at least, but he had never really understood the voices. Miranda helped to refashion some of the doors. Now the voices were louder. So was Miranda’s. A Persistence of Ghosts by Gregory Scheckler	The Ghosts don’t really go away, they just become something else. And the choice of what they become is not yours. Ligeia by Sandi Leibowitz	Here is an explanation for the existence of the word “Harpy.” Its modern day meaning is consistent with the content of this story of betrayal. This Old House by Nora Mulligan	Maybe the house will be happy now that the doctor has arrived. Granny Grizz	by Tom Howard	Doctor Alex thought he had a secret. Now he will get a test from his patient Gabriele. A cold heart will bring a very early winter. Bittersweet	by A.E. Decker	Marcel is a specialist in chocolates. There are none like his. He is especially busy on Valentine’s Day. His chocolates promise love for those to whom his customers give the chocolates. Occasionally the taste of his chocolates was enhanced by his magic. But where is the love for Marcel? I received a copy of this book in exchange for an honest review. I loved this book of 15 short stories! They were diverse and included flower faeries, werebears, cats, butterflies, haunted objects, taxidermy and re-animation. World Weaver Press gave me a wonderful opportunity (free in exchange for an honest review) to review a delightful book entitled Speculative Story Bites, an anthology of fifteen short stories. These stories had every type of character the speculative fan could want: magic, fairies, vengeful trees, androids, and talking cats. While vulgar language in some of the stories was a bit overdone for my taste, it did fit in with the character’s vocabulary and temperament. 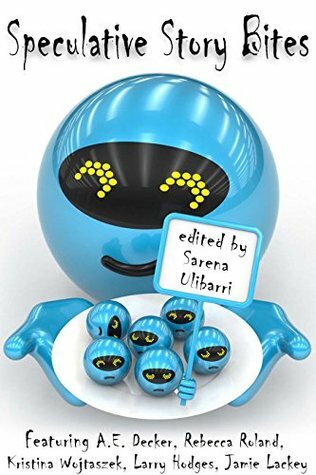 One of my favorite stories was “A World Weaver Press gave me a wonderful opportunity (free in exchange for an honest review) to review a delightful book entitled Speculative Story Bites, an anthology of fifteen short stories. These stories had every type of character the speculative fan could want: magic, fairies, vengeful trees, androids, and talking cats. While vulgar language in some of the stories was a bit overdone for my taste, it did fit in with the character’s vocabulary and temperament. One of my favorite stories was “All the Pieces of My Heart.” Without giving away any spoilers, let’s just say being a wereteddy bear has its drawbacks. “Wild Corner” is another good story bite of Mother Nature’s revenge. “The Museum of Haunted Objects” although written well, had a predicable ending as did the humorous “First Cat.” “First Cat” did make me laugh at the ending. “Ligeia” explored the development of several Greek/Roman mythological characters and its heartbreaking ending gives the reader a viewpoint on how bad consequences happen to someone without it ever being their fault. Another sad story is “A Persistence of Ghosts” echoes the anguish of memory loss and sacrifice. A mix of short stories of varying lengths focusing on Horror and Sci-Fi with a little YA for good measure.. Like most collections of short stories, this compendium is a bit of a mixed bag. Some are really well written and captivating, and others are so-so. I particularly liked "The Museum of Haunted Objects" by Megan Neumann. Overall the collections offers a set of easy-to-read short stories. I didn't get: "This Old House" "The Legacy of the Butterfly King" "John Knocking" "A Persistence of Ghosts" "Granny Grizz"
I just didn't like it, wasn't what I usually read: "The Business of Thorns" "Three Grams" "The Museum of Haunted Objects"
Really, really liked: "The Gift of Death" "All the Pieces of my Heart"
It was okay, interesting at least: "Hummer" "The Wild Corner" "First Cat" "Bittersweet"
I received this book free from the Imaginarium convention in Louisville, Kentucky. Sarena Ulibarri attended the Clarion Workshop in 2014 and earned an MFA from the University of Colorado at Boulder. She's Editor-in-Chief of World Weaver Press.